In 1977, Stephen King was told that publishers were unwilling to release more than one book by an author for fear of market saturation. 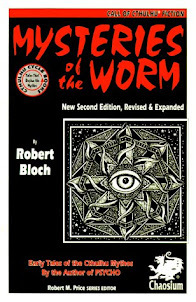 King was cranking out novels at a feverish pace in the late 1970s, so he decided to release books under the nom de plume, Richard Bachman. Rage was the first of what would be five novels released under the name Bachman before Bachman’s secret identity was revealed by a book store clerk. 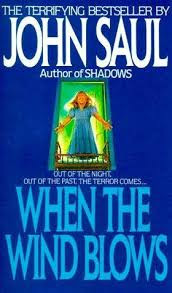 It also the only book authored by Stephen King to be out of print, pulled by King himself. The book opens by introducing the reader to Charlie Decker, a high school senior who is essentially a good person, but is severely socially maladjusted. Earlier, he beat a math teacher severely and was being counseled by the school psychologist. After a visit to the principal’s office, Charlie retrieves a pistol from his locker, returns to his algebra class and shoots and kills the teacher. Another teacher responds to the ruckus and Charlie kills him as well. He then holds his classmates hostage. The hostage situation evolves into a confessional and encounter group where several of the students confess dark secrets and fears. Charlie acts as a facilitator. He stages a blow by blow fight between two girls who exchange insults until one concedes and apologizes. He also antagonizes one classmate who won’t participate. Ted Jones is the popular guy in the school and fancies himself a leader. Since Ted won’t participate, Charlie is able to coax other students to reveal some of Ted’s dark secrets. Ted is enraged and Charlie is wary that Ted is going to try to take him down. School officials communicate with Charlie via intercom whilst police and parents gather on the school lawn. Charlie uses his hostages to humiliate and belittle them by forcing them to answer embarrassing questions lest he shoot someone. At one point, a sharpshooter takes a shot at Charlie. It is a direct hit in Charlie’s chest. However, upon leaving his locker, he took his combination lock and put it in his chest pocket. The lock deflected the bullet. Finally, Charlie tells the principal the whole ordeal will be over in about 30 minutes. He and his hostages must finish, “getting it on.” He invites his hostages – most of whom sympathize with him – to teach Ted Jones what it means to be a kid in a kid versus adult world. Charlie releases his hostages and is taken alive. He is committed to an asylum. We also found out that Ted Jones never really learned any lessons. He, too, is in an asylum where psychologists do not have high hopes for his recovery from his nervous breakdown. Interspersed within the story are flashbacks in Charlie’s life that reveal how he became so cynical and disturbed. A protective mother and a father who is at first domineering, and then dismissive. Charlie’s sad childhood led him to the hostage situation. Rage is an interesting novel. Of King’s published body of work, it is probably the least well written. The psychoanalysis is rather foolish and immature. The flashbacks often interrupted the narrative at the wrong points. However, it moved at a rapid pace and Charlie was an interesting character. The narrative read like a much darker version of the classic 80s movie, The Breakfast Club. It explores the social layers of the typical high school culture and deconstructs them. I found Rage a much more realistic and interesting deconstruction of teenage society than The Breakfast Club. 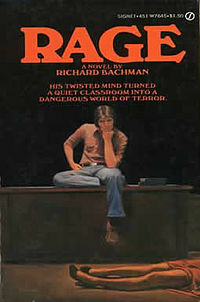 Rage was originally published as a paperback in 1977 and later included in the compilation of early Bachman works called The Bachman Books. Laying one’s hands on a copy of Rage is not easy today. In 1996, Stephen King had his publisher pull it from publication after Michael Carneal shot up a prayer meeting in East Paducah, Kentucky. He had a copy of the novel in his possession. Already linked to three earlier school shootings, King felt a social responsibility to take the novel out of print. Rage is a decent novel and far better than later Bachman works like Thinner and The Regulators. It is too bad the psychologically unstable among us had to draw something from the prose other than a good story because they’ve robbed fans of suspense literature of a good book.